If you have been injured or are dealing with long-term pain, please come experience what cold-laser therapy can do for you. We combine cold laser therapy with acupuncture and naturopathic medicine to promote safe and swift recovery for patients in a relaxing environment. Our doctors are Oregon Licensed Primary Care Physicians, Dr Danielle Lockwood ND LAc & Dr Vy Simeles ND, LAc. In addition to being Naturopathic Doctors, our physicians are also Licensed Acupuncturists. Our treatments bring the best of herbal, naturopathic and Chinese medicine together with modern techniques like cold laser therapy in a caring, compassionate environment. We are accepting new patients at our Sw Portland, Oregon Naturopathic medical and acupuncture clinic, Terrain Wellness. If you have acute or chronic muscle/joint pain, please contact us today to feel better tomorrow. Cold laser therapy stimulates pain relief with a local analgesic effect on the area where the treatment is applied. Cold laser therapy improves circulation and blood flow to treated areas. Cold laser therapy improves Biomodulation, which is the mechanism by which cellular change is experienced in a living system. Biomodulation using light therapy increases cellular metabolism, which helps cells clear debris left from inflammation and damage due to injury or chronic physical stress. Cold laser is frequently used for the promotion of wound healing. Low-Level Laser Therapy has been shown to decrease wound healing time for certain types of injuries. (2). Cold laser therapy is a safe, simple and effective way to reduce pain, inflammation and stimulate a quicker healing response. Also known as Low Level Laser Therapy (LLLT), cold laser therapy has a number of benefits like local analgesia (pain relief) while reducing the time required for an injury to heal. Cold laser therapy is distinct from surgical, Class 4 lasers. Surgical, class 4 lasers are used in surgery to cleanly cut body tissue using a wavelength that generates heat. In contrast, cold laser therapy uses a much more gentle class 3B laser which emits no heat and is painless while at the same time working powerfully to alleviate pain. How Does Cold Laser Help with Physical pain and Trauma? Cold laser therapy can be very effective when used in combination with other treatments such as acupuncture, joint mobilization and massage for the relief of pain and muscle tension. Cold laser therapy is often preferable to other methods because it works quickly and without potentially-addictive medications. Cold laser therapy emits a specific frequency of light that can penetrate through skin layers and improve the body’s healing response without causing more trauma to damaged body tissue. In our Integrative Medical Clinic in SW Portland, Oregon, we use cold laser treatments to help speed recovery times for patients suffering from acute physical trauma from events like car accidents and sports injuries. After we evaluate and assess all injuries with a complete physical exam, we may find it medically beneficial to incorporate cold laser for car accident injuries to help modulate pain and inflammation while not triggering further inflammatory responses. Most patients find cold laser therapy relaxing and feel relief from muscle tension in about half the time as conventional treatments. 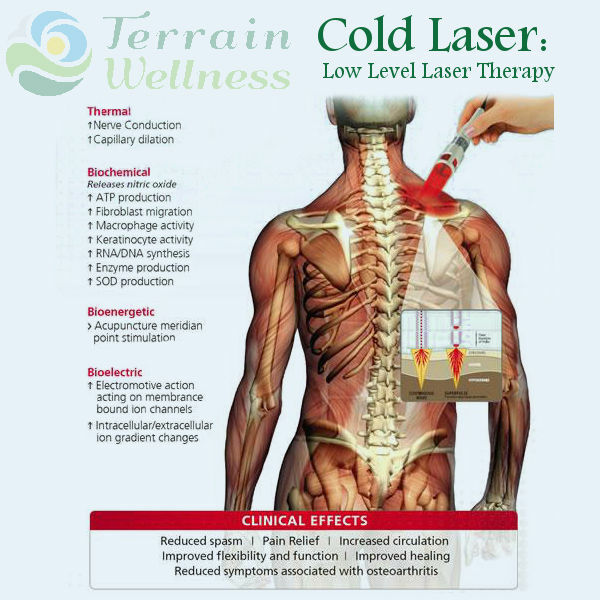 At Terrain Wellness, we use cold laser as an adjunct to our already robust care as a way to further increase healing results for our patients. As an example, for patients who come in with muscle/joint/back pain, we treat every aspect of pain by mobilizing joints connected to the affected region of the body while balancing nervous system responses to pain with acupuncture. Additionally, we resolve generalized inflammation in the affected area using nutrition and herbs while also addressing the emotional distress patterns that accompany severe pain using Neuro-Emotional Technique (NET). Where applicable, we combine these treatment modalities with cold laser therapy to support the localized inflammatory response, modulate the immune system and relax tight, painful muscles. We find that using cold laser in conjunction with natural, non-pharmaceutical pain-relieving solutions offers a healthier way to be free of pain in that it does not rely on habit-forming medications. For these reasons, cold laser therapy is a part of how we help patients recover from acute and long-term pain and injuries. If you have other questions about cold laser therapy and how these treatments can be used with naturopathic medicine and acupuncture, please call us today to set an appointment. Our compassionate doctors are licensed Primary Care Physicians in Portland, Oregon who are also licensed acupuncturists. Thank you for taking the time to visit our site, we look forward to helping you feel better soon. 2. Hopkins JT, McLoda TA, Seegmiller JG, David Baxter G. Low-Level Laser Therapy Facilitates Superficial Wound Healing in Humans: A Triple-Blind, Sham-Controlled Study. Journal of Athletic Training. 2004;39(3):223-229.